Woe unto those who stare directly at the grille of the 2020 Chevrolet Silverado HD! Thy villages burned to the ground, thy fields plowed asunder! They who looketh at it shall immediately be turned to stone! 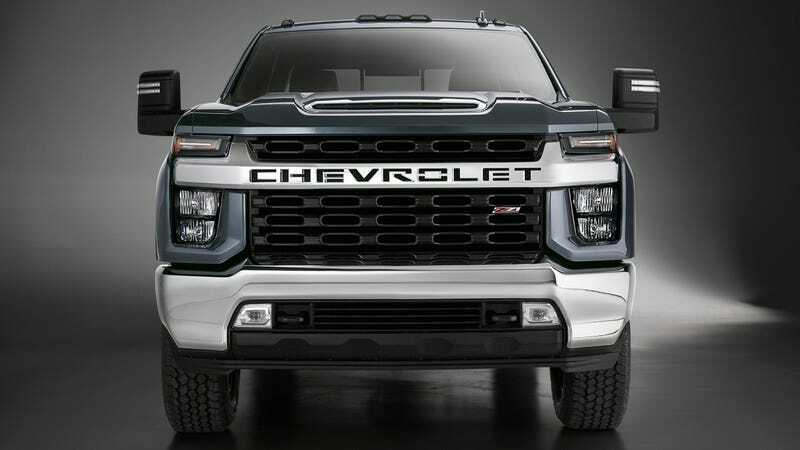 There’s a big square face with a massive bar across its eyes and it screams at you “CHEVROLET,” as if its an order to run away rather than the name of a reasonably-priced American transportation company. Mission accomplished then. Chevy hasn’t released too many details just yet in the official press release, but will only say that it’ll have “an all-new gasoline engine,” which is mysteriously light on even the vaguest details such as the number of cylinders, and the venerable turbodiesel V8, with 910 pound-feet of torque hooked up to a new 10-speed transmission. And just 90 torques short of 1,000 ain’t nothing to sneeze at. And there are steps to help you access things in the back of it, and pickups, much like minivans, live and die by their ease of use. So that’s good. With the 2020 Chevy Silverado HD, it’s all business in the back, and some sort of deeply strange party up front.